Virginia O’Dell is celebrating her 100th birthday on Friday. Virginia is the type of person everyone wants to be like – kind, considerate, honest, caring and thoughtful. She was born March 22, 1919; her parents were Samuel and Julie McCabe. She married Robert (Bob) O’Dell on Aug. 11, 1936 and had two sons, Ronnie and Larry. Both Bob and Virginia worked at Producers Livestock in Greenville and she was the office manager. They lived on their farm where they milked Holstein cattle. Virginia says, “With that responsibility, you didn’t take vacations.” She enjoyed sewing in 4-H when she was younger and later became leader of the Nifty Neave 4-H club. Many great memories are from her family showing the cattle at the Great Darke County Fair where they won many awards. Bob always took pride in doing yard work; he always wanted it to look good. They both were interested in vegetable gardening and Virginia has always had a special love for flowers. After retirement, the O’Dells enjoyed their mobile home in Angola, Indiana, where they could get away and relax. She plants geraniums of all colors; some are kept over from year-to-year in her garage. Her favorite perennial is the hosta. The vegetable garden has reduced in size but she still likes to grow some cabbages, green beans and tomatoes. At the age of 62, she became a member of the Wildflower Garden Club and 38 years later still remains active in the club. She is always in the Flower Department on flower show days and has won many rosettes for traditional designs, roses and spot garden. The Wildflower Garden Club staged a home flower show titled “Country Charm” in her home. Virginia stays busy hand-stitching more than 20 quilts, all with vibrant colors, for family members to enjoy. She is determined to stay busy. She attends the Ft. Jefferson Methodist Church. 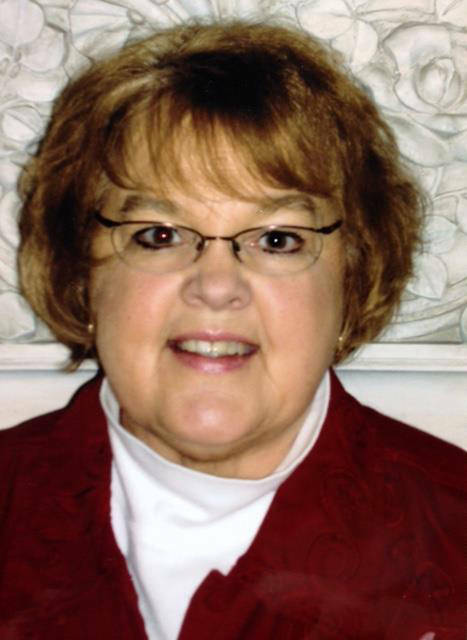 She is President of the Women’s Society, President of Darke County Senior Citizens where they play cards every week and very much enjoys her garden club. She has participated in floral design and horticulture classes in the Flower Department of the Darke County Fair. 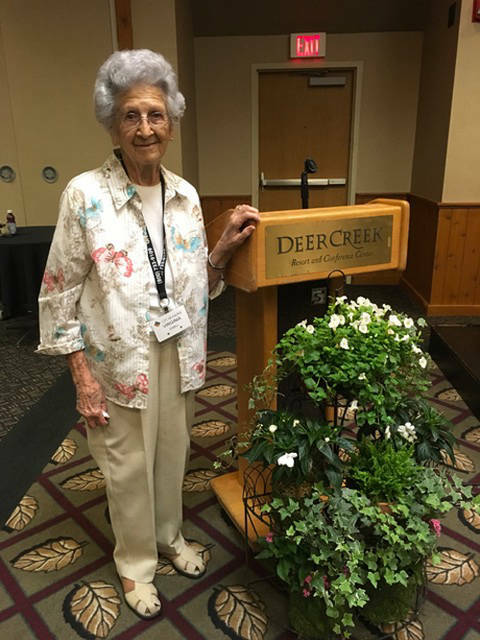 She attends Regional meetings for The Ohio Association of Garden Clubs and has entered flowers shows when they were staged at the Garst Museum and The Brethren Retirement Community. She indicates her biggest accomplishment was in 2017 entering the fair flower show. The class was “Traveling with American Pickers,” a traditional medium design. It was a design she thought would bring back childhood memories of many viewers; she won first place with the design. Even more memorable was a Special Award, “Louise Sheffer Award,” a rosette and monetary donation that came along with that honor. She has won numerous rosettes at the fair along with many first, second and third place ribbons, but none quite as special as the Sheffer Award. Virginia was encouraged to join her garden club by my mother, Louise Sheffer, and they remained good friends until mother’s passing. Virginia has collected spoons from all states, angels, chickens and bird houses. She enjoys watching the birds but says her pride and joy has been her family and friends. A testament to her outstanding life was evident when she was recently honored with a special birthday celebration held at the Moose Lodge. The entire meeting room was full of all of Virginia’s friends and family. Virginia has been truly blessed with 100 wonderful years of life and memories. Happy birthday, Virginia, and we’ll see you at the fair!